Old enough to replace? Or salvageable enough to repair? If you have an older or damaged fence in your yard, it can be difficult to decide whether it’s a better idea to repair or replace your wood fence. While it’s almost always possible to repair a wood fence, it’s often a better idea to replace the whole thing for better security and greater peace of mind. So, should you repair or replace your wood fence? 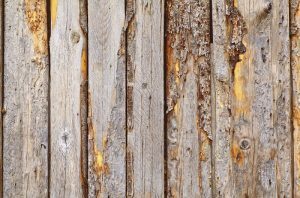 Termite Damage: Depending on how badly the wood fence is damaged, you might be able to repair the damage. In many cases, the wood fence will need to be replaced instead. Rusted or Missing Nails: These nails should be replaced. Sagging Fence Posts: Fence posts can sag as a result of damage within the fence post itself or the hole that the fence post sits in. If the post is rotted, it should be replaced. If the hole that the wood fence post is sitting in is too large, fill it in with gravel or concrete. Missing Rails or Panels: As long as the missing areas aren’t too large, you can replace these. Sagging or Wobbly Fence Panels: This may happen as a result of many different things, from insect infestation to weather in the neighborhood, so the wood fence might need to be repaired or replaced. Whether you have to repair or replace your wood fence, there are several ways that you can prevent future problems. This entry was posted on Friday, May 5th, 2017 at 12:05 pm. Both comments and pings are currently closed.